UDM Downloads > AKVIS Retoucher! AKVIS Retoucher is a plugin to image editors, photo restoration and photo retouching tool. 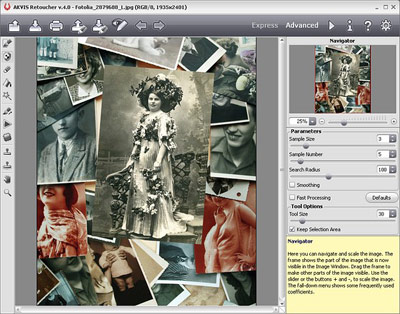 Retoucher removes dust, scratches, stains and other defects that appear on damaged photos. The plugin reconstructs the lacking parts of a photo using the information of the surrounding areas. The work is done automatically; you only have to indicate areas to be restored, push the button, and here you are - the surface becomes smooth and imperfections disappear. It looks like magic when you observe the scratches vanishing before your very eyes. Use AKVIS Retoucher for the following purposes: restore old and damaged photos from your family archive by removing scratches, stains and other defects; improve the composition of your photos by removing the date stamp, distracting details (wires, refuse bins, etc) and by extending the photo canvas (increase the image canvas and the plug-in will recreate the image patterns in the blank areas); reconstruct the lacking parts of the photo (to restore a torn photo, in polygraphy to grow the borders of a layout that does not have space for cropping). AKVIS Retoucher is your reliable tool for increasing productivity! AKVIS Retoucher plugin integrates into the image processing programs installed on your computer. The plug-in is compatible with Adobe Photoshop, Photoshop Elements, Corel (Jasc) Paint Shop Pro, etc.